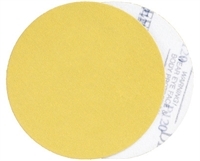 Applications: Grip sanding discs are mainly used on hand-held sanders, both rotary and DA. They can also be used in place of PSA backed discs on belt and disc machines using a conversion disc that is PSA backed on 1 side and hook backed on the other. This gives the convenience of quicker change over. Grip discs can be cut in a range from 19mm diameter to 810mm diameter. Cutting tools are available to accommodate most dust extract holes. Abrasive Paper: Aluminium oxide, zirconium, silicon carbide. Abrasive Cloth: Aluminium oxide, zirconium, silicon carbide, ceramic, Trizact. Also Available: We have an extensive range of grip disc backing pads for rotary sanders and for DA sanders. We can also supply discs with PSA backing. We stock grip backed sanding discs in aluminium oxide abrasive in 125mm and 150mm diameters.